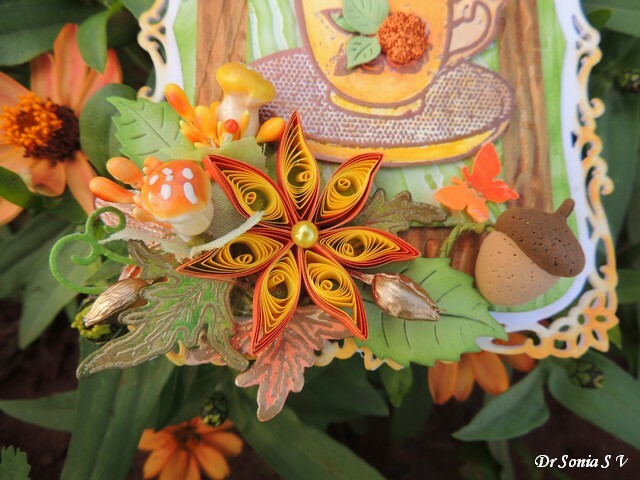 Hi friends , sharing yet another fall card in bright orange colors! 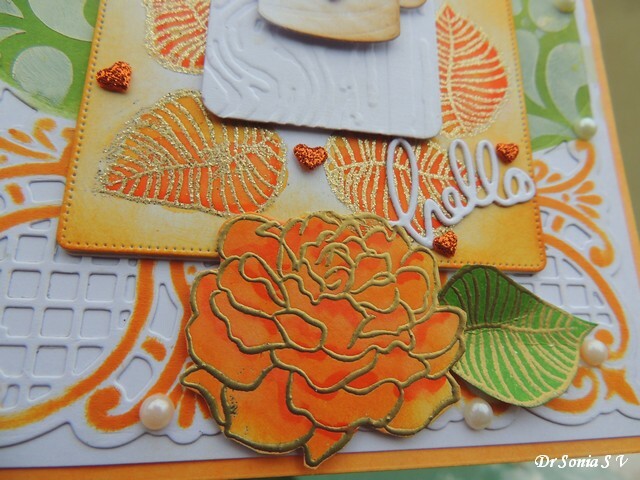 I heat embossed leaves from the Winnie and Walter In Bloom Elsa's Flora Stamp Set using WOW Metallic Gold Sparkle and water colored it in lovely orange shades . 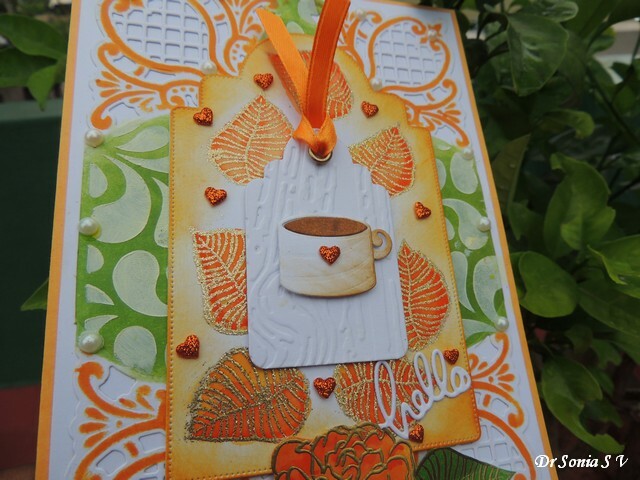 Made a cup of coffee using Marianne presents die and Memory Box 's splash border[ the mug handle] and layered it atop a wood grain embossed tag! 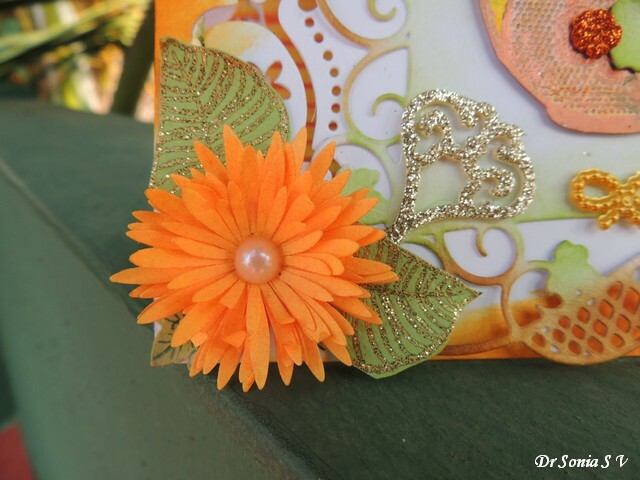 A rather bright card if I may say soo myself but somehow I am in love with bright cheerful orange nowadays! 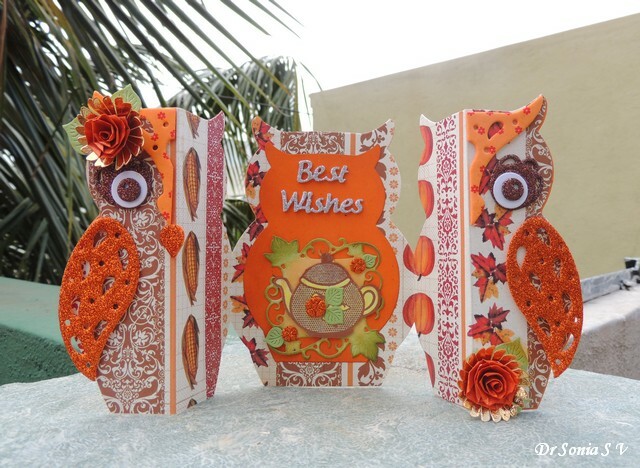 Hi friends, I just couldn't resist making another Owl Card...especially since I found to my amazement that so many of you loved owls!! 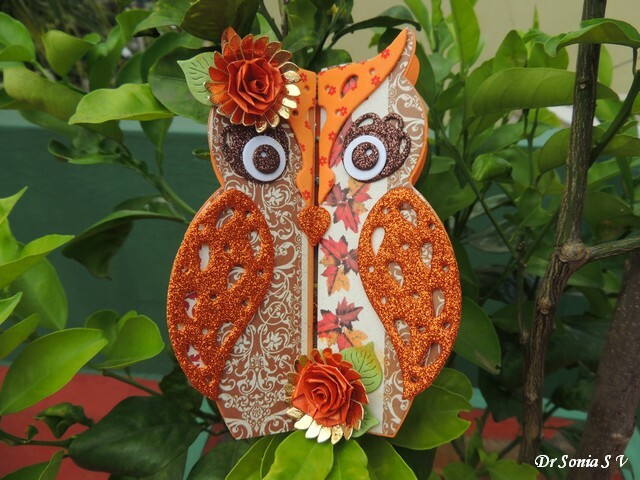 This gatefold Owl card was so easy and fun to make since I used a Sizzix Owl Fold A Long die , part of the candy I had won from Katarina...blogland is an amazing generous place! 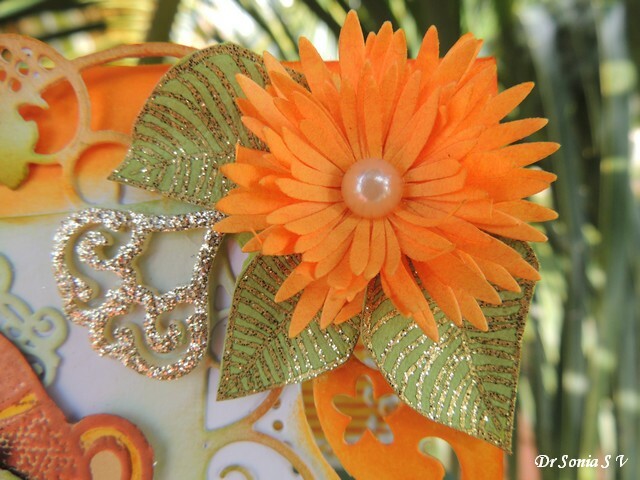 The flower and leaves I used at the bottom is from Winnie and Walter In Bloom Elsa's Flora Stamp Set .I used WOW Metallic Gold Sparkle embossing powder on the leaves...its one of my favorite embossing powders! 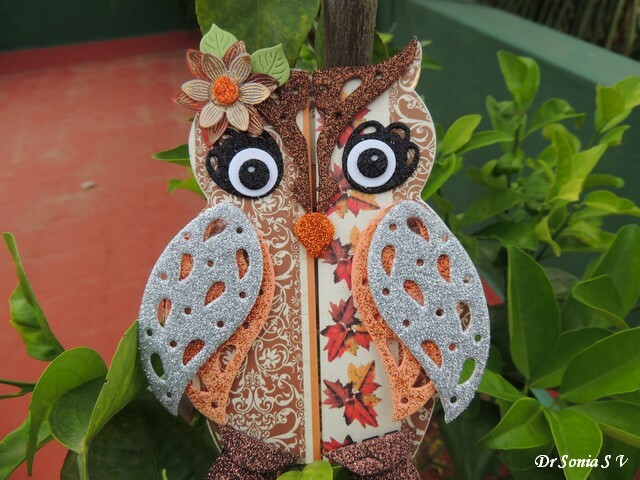 My owl has a pattern paper base [ details below] and details made using foam. 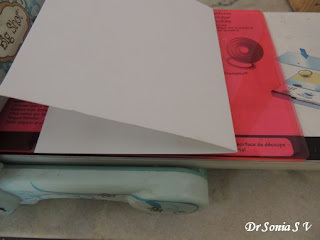 I love to use foam to give light weight dimension in papercraft projects ! 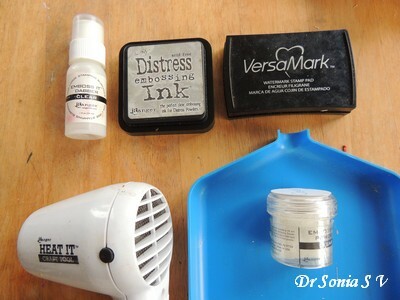 Sticking it however can be tricky...you can use tacky tape/ Aleene's tacky glue or fabric glue. 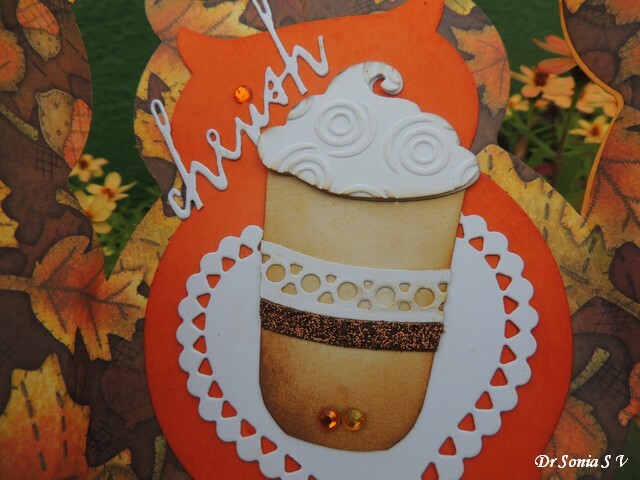 Since this card is for the Fall Coffee Lovers Blog Hop I wanted to add a nice cup of Cappuccino inside my card but I didn't have any cup/ glass die so I improvised and made a creamy frothy cup of coffee with dies I had in my stash! 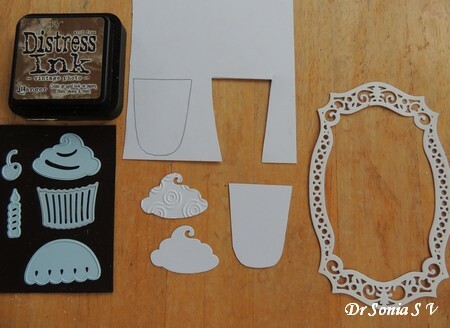 I drew the glass freehand and used the "icing" from a Marianne Cupcake set to make the frothy cream of my coffee! Cut up a Spellbinders die cut to make the sleeve of my coffee cup! I am so happy with the way it has turned out! 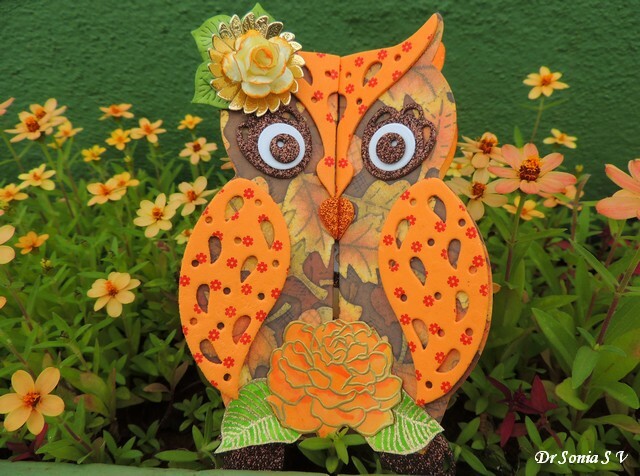 And here is my Owl Fancy Fold card sitting happily amongst the flowers in our terrace garden. 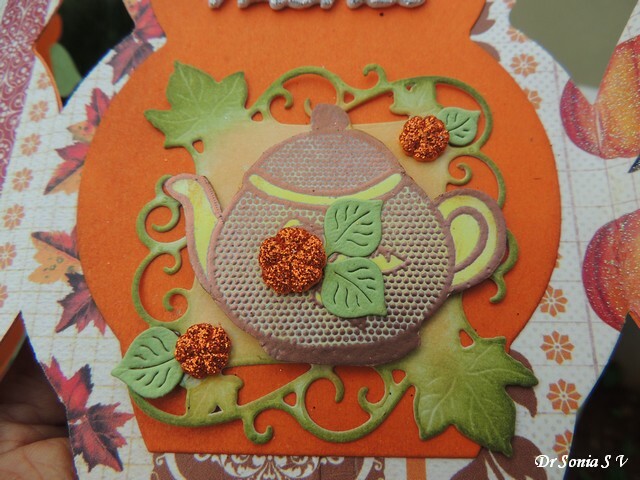 Hi friends I am on a crafting spree and enjoying making cards for the Fall Coffee Lovers Blog Hop!The teapot is a Kaisercraft Tea Party stamp embossed with WOW's Metallic Copper embossing powder and layered on a Spellbinders decorative curved square die cut. 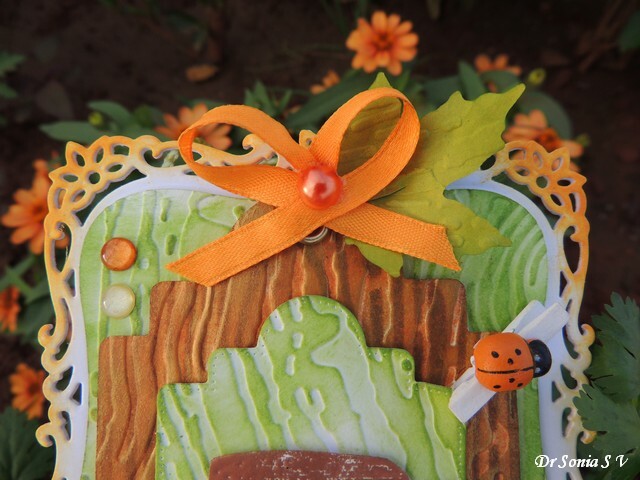 I used a Martha Stewart border punch to make a fall themed leafy frame to decorate the inside of the card . 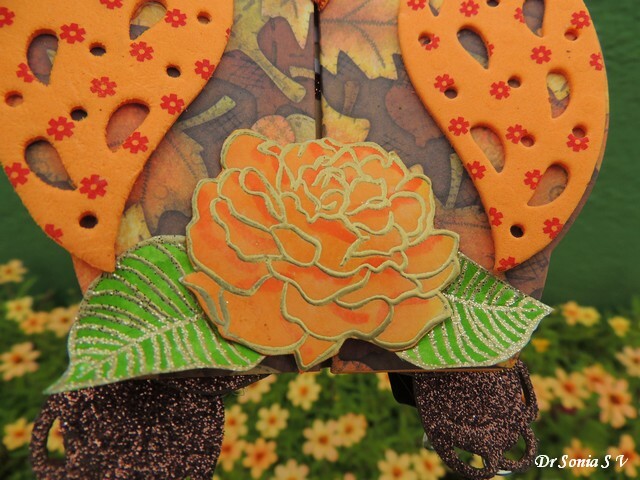 Also added a few punched butterflies and in this view you can also see the lovely aperture style floral vines created using the Couture Creations Venetta die . 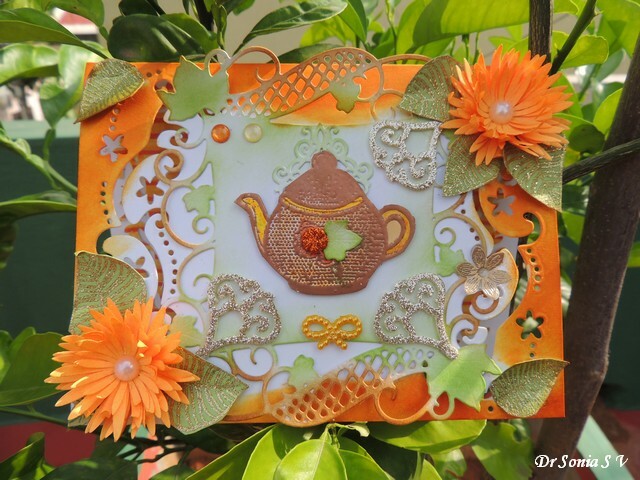 And that is the card sitting amongst the flowers in our terrace garden!Hope you like the riot of bright colors! Hi friends I hope you are not bored of seeing fall colors on my blog! 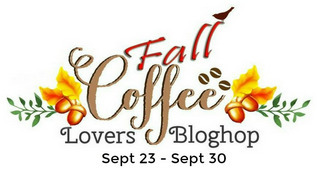 Sharing another project I made for the Fall Coffee Lovers Blog Hop. 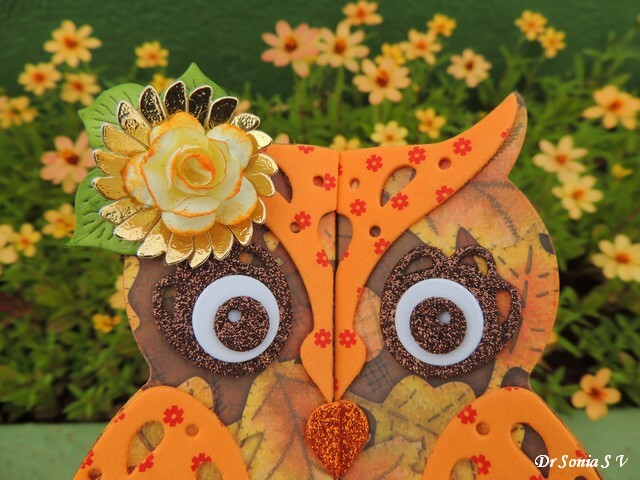 I made it by embossing some Poppy Stamps Pinpoint Main Street Tags die cuts with Spellbinders wood grain embossing and layering atop Spellbinders die cuts. 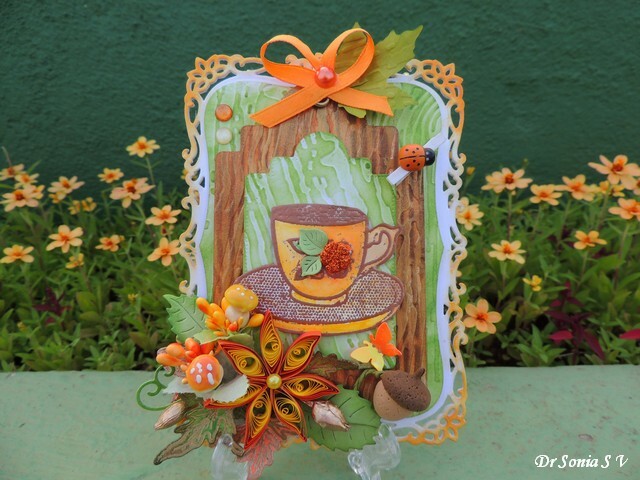 Love how the green , brown and orange shades came together in this one! The little ladybug is a tiny cloth-peg I picked up from my local super market....isn't it cute!! 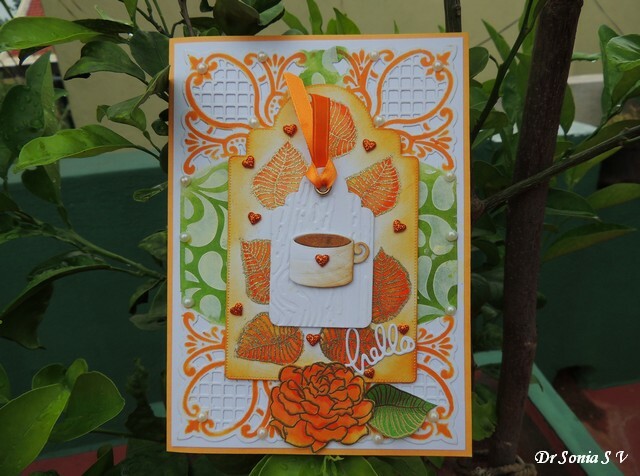 The coffee cup was created by heat embossing a Kaisercraft Tea Party stamp with WOW's Metallic Copper embossing powder. And giving it company is a quilled flower , cute little mushrooms and an acorn I made using air drying clay and a Plaid mold. 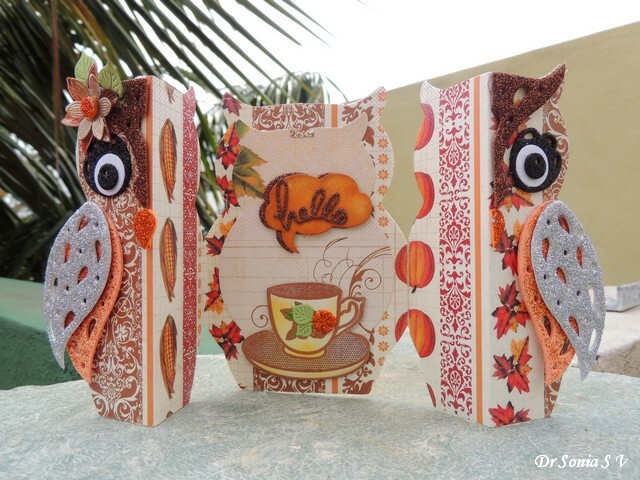 Hi friends...here is another Owl shaped fancy fold card I made for the Fall Coffee Lovers Blog Hop. This one is similar to the Fancy Fold card I shared earlier but with a little variation. When the card swings open there is a nice hot cup of coffee with a "hello" rising up from the steam! 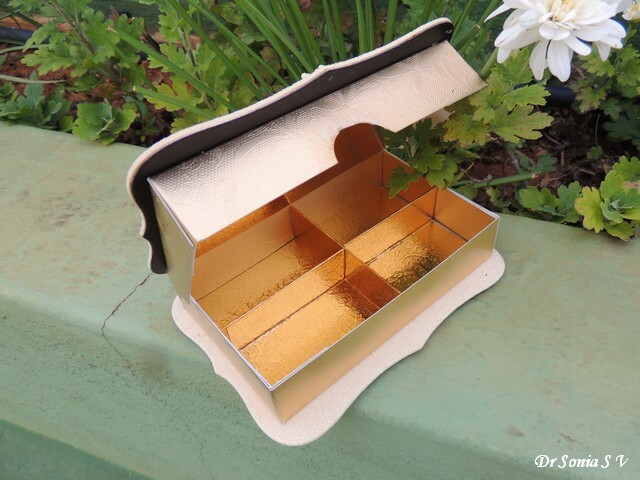 The cup was created by heat embossing a Kaisercraft Tea Party stamp with WOW's Metallic Copper embossing powder. I love making and seeing cute cards, they cheer me up!! !....How about you?! 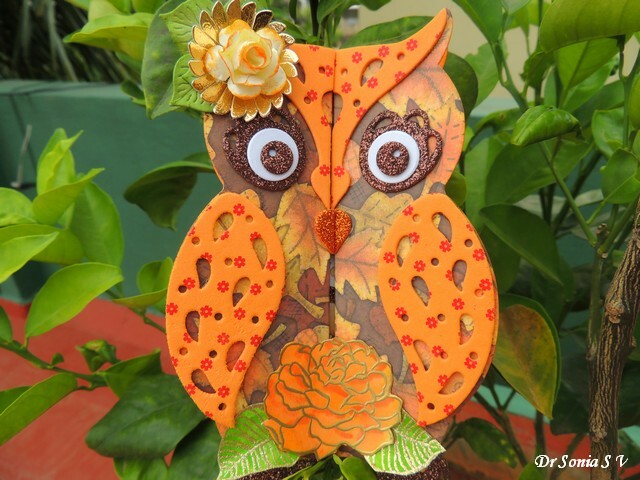 Hi friends...sharing something cute and cheerful....an Owl shaped fancy fold card in fall colors made for the Coffee Lovers Fall Blog Hop! 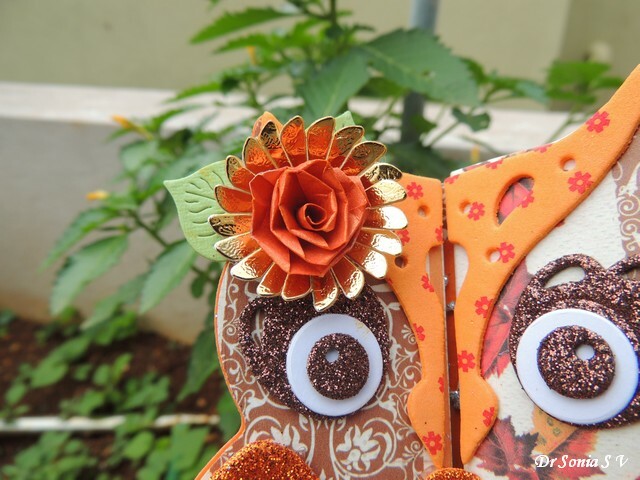 My little owl is a girl and has sparkling brown eyes and wears a quilled rose on her head! The card swings open in a gate fold fashion and you get a nice impressive large card! 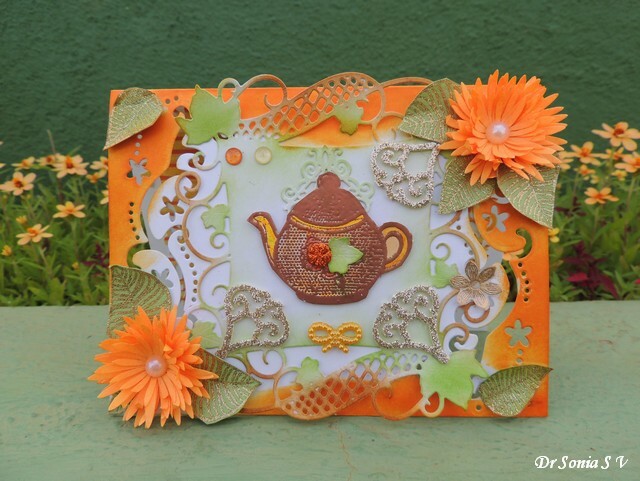 On the inside panel , I added a nice tea pot full of coffee created by heat embossing a Kaisercraft Tea Party stamp with WOW's Metallic Copper embossing powder. 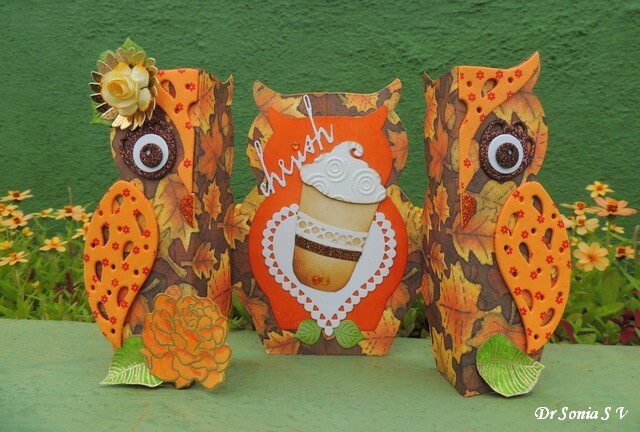 This card was so fun to put together using a Sizzix Owl die which was so generously sent to me by Katarina all the way from Scotland [as part of her candy which I won]!Thank you so much Katarina for taking so much trouble! 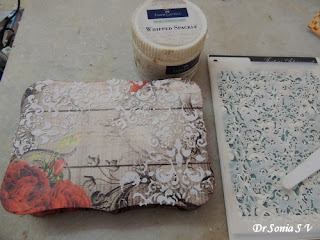 But fuzzy cutting can be tiresome at times and here is an easier ,quicker way to create the 3 D decoupage look using dies. 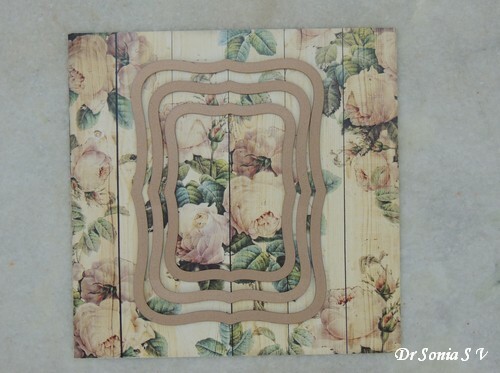 I saw this technique at Splitcoast Stampers using stamped images and they called it Telescoping image technique . I tried adapting it to pattern paper and loved how easy it was! 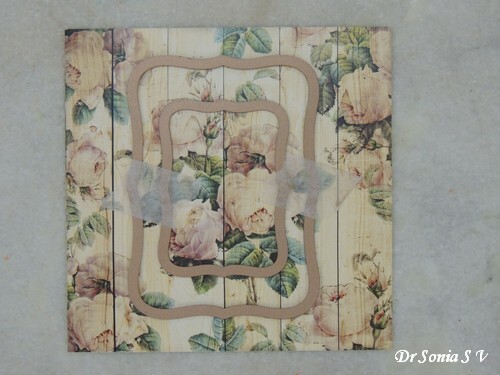 For this technique you need 2 stamped images or pattern papers and 4 nesting dies. 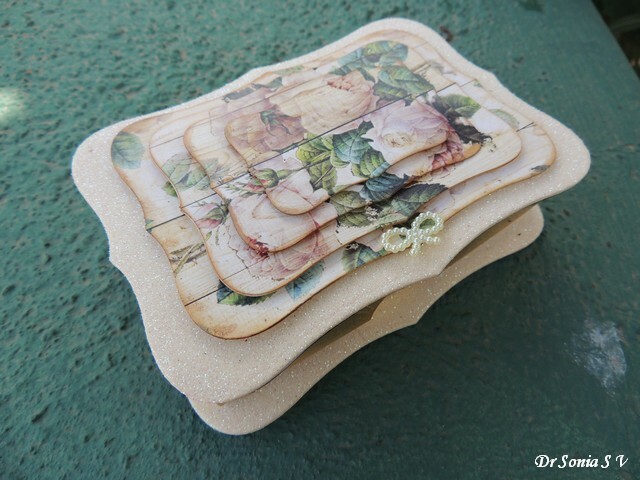 I have used 4 dies from the Spellbinders Labels 8 die set. 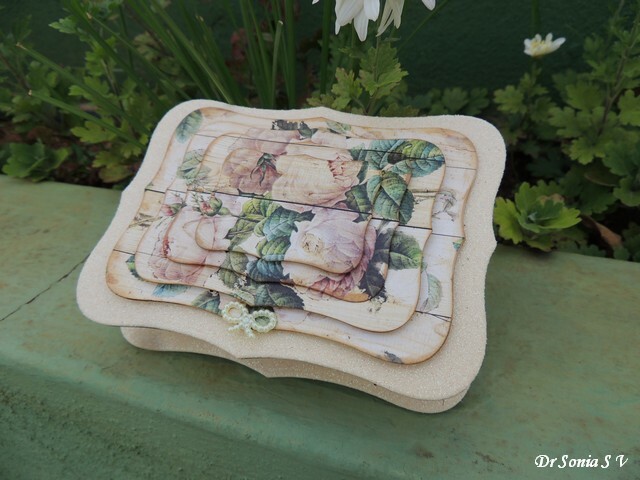 You can use any nesting die set you have. 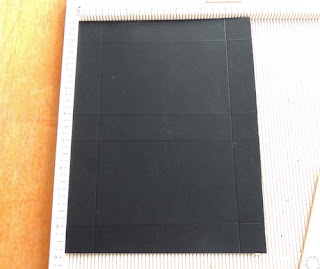 Place the 3 larger dies on the paper/image and remove the middle one. 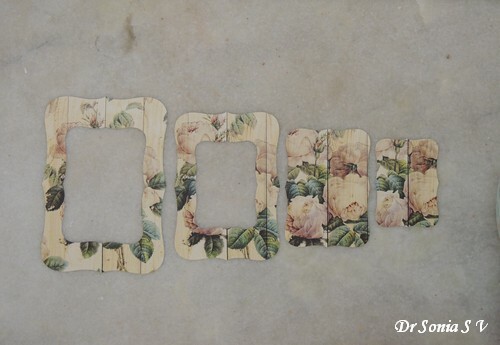 Tape the other 2 to the paper and cut through your die cutting machine. 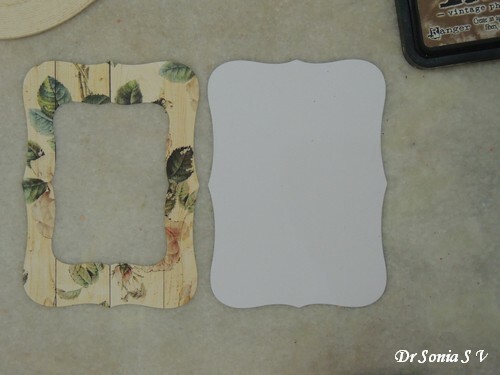 Replace the dies on the 2nd sheet of pattern paper/ image and this time use the smallest of the 4 too ie if you are labelling the 4 dies as 1,2,3,4 from smallest to largest, you will be using numbers 1 and 3. Tape the dies 1 and 3 to the paper and die cut. 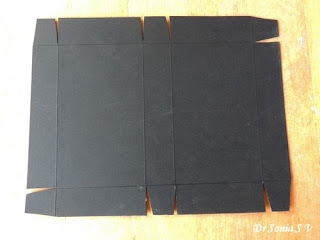 You will get 4 die cut frames as shown .These are now ready to be stacked atop each other using foam tape. 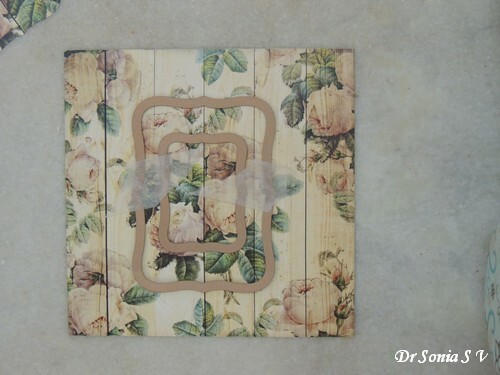 I found it sturdier to stick the die cuts with the center aperture to a similar die cut before layering. Isnt this a cool technique to make a 3 D pyramage image! Hope you liked this easy technique to create Pyramages! Hi friends , Hope you had a wonderful weekend. 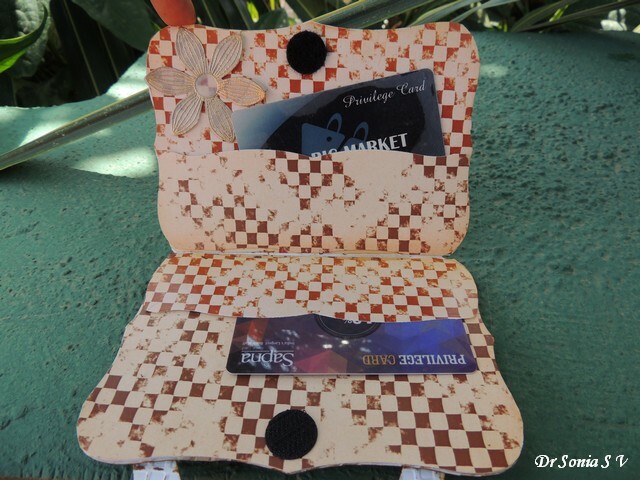 Sharing an easy tutorial to make a fun Purse Shaped Gift Card/ Money Holder. 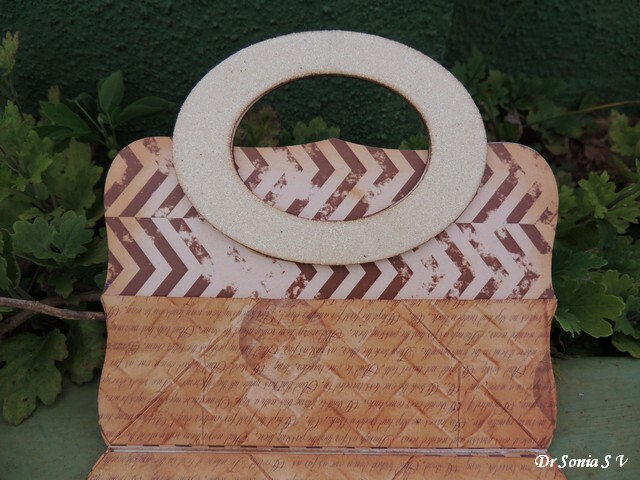 If you don't have a die cutting machine , don't despair, you can easily handcut a purse shape like I have done in the posts here : Bag Shaped Card Tutorial and Explosion Purse Tutorial . 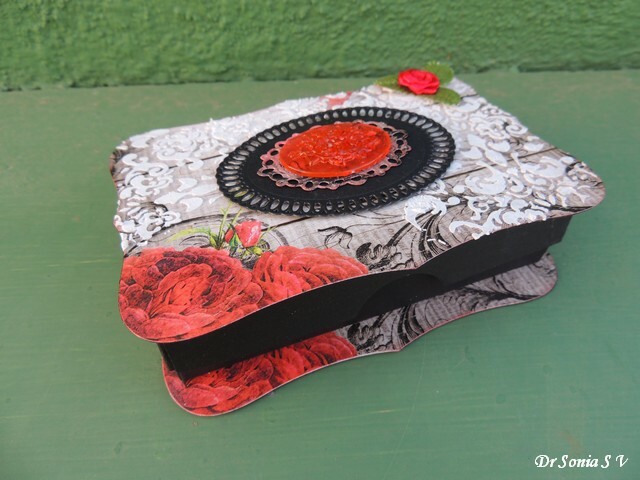 Here I have used the Spellbinders Labels 8 die set though you can use any die in your stash you feel will look good as a purse! 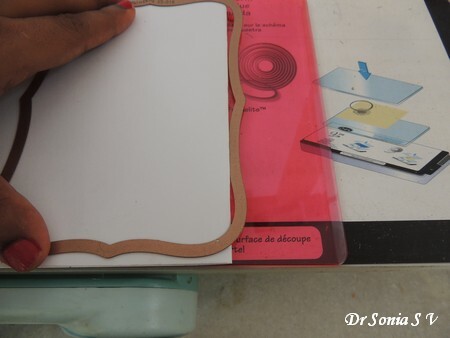 One of the easiest ways to create a shaped card is to place the die over the edge of a folded card and run it through your machine. 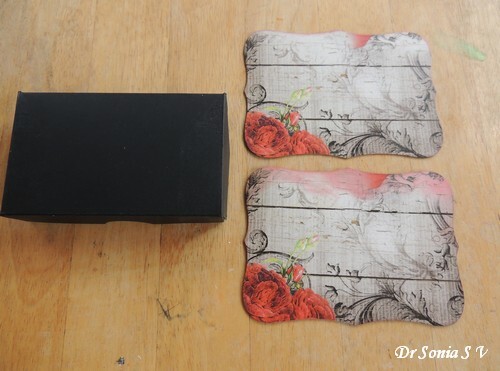 If you are using thick card stock and the die doesn't cut through both the layers ...invert it and run through again with the cutting side up! 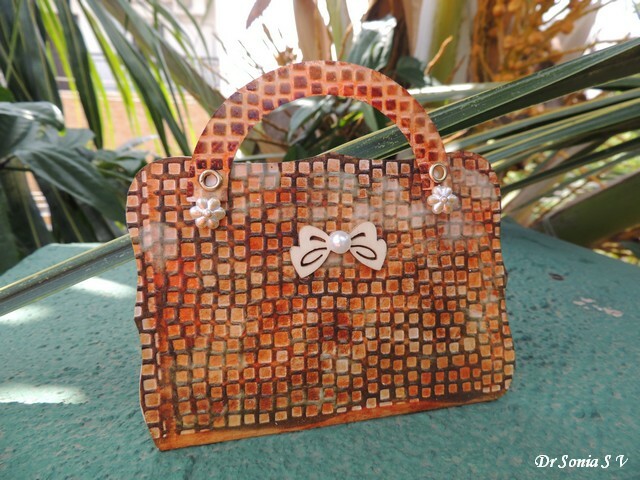 Once you have cut out your basic purse shape, run it through an embossing folder . Then pounce on it with Distress Inks ! 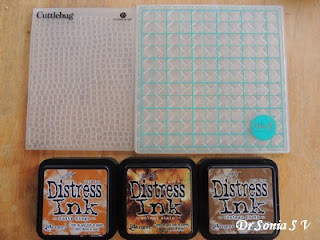 You can use 1 or more shades and try various things like using a sponge or simply swiping the ink pad over your embossed paper...both techniques of ink application will give entirely different looks! You can create a shiny faux leather look by dabbing Embossing ink [ Using Ink-pads like Versamark or Ranger's Distress Embossing Ink or using an Embossing Ink dabber] all over your embossed card , sprinkling clear embossing powder and heating it! 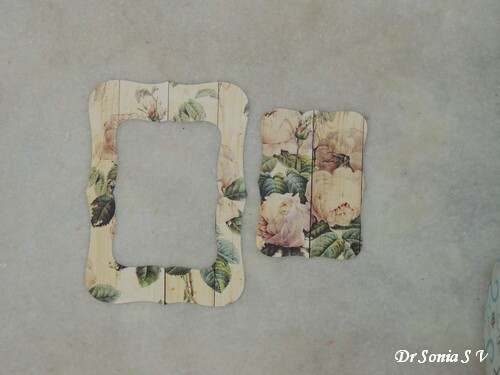 Make pockets on each side of your purse using the same die and trimming the die cut to add to the central fold line. 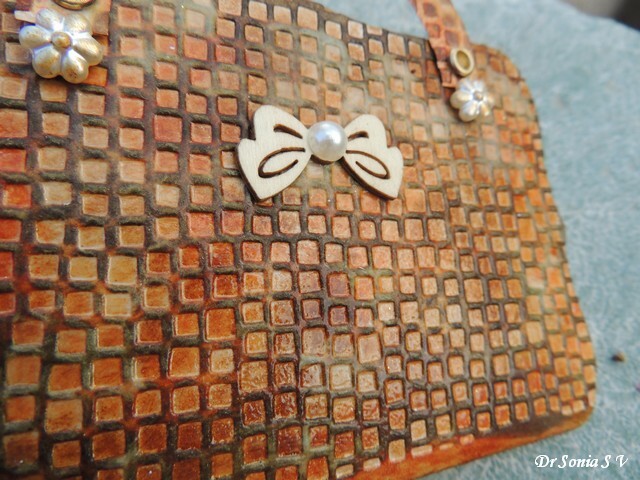 You can use different embossing folders to make different styles of purses and if you want to make a quick purse without all the embossing ,use simple pattern paper! 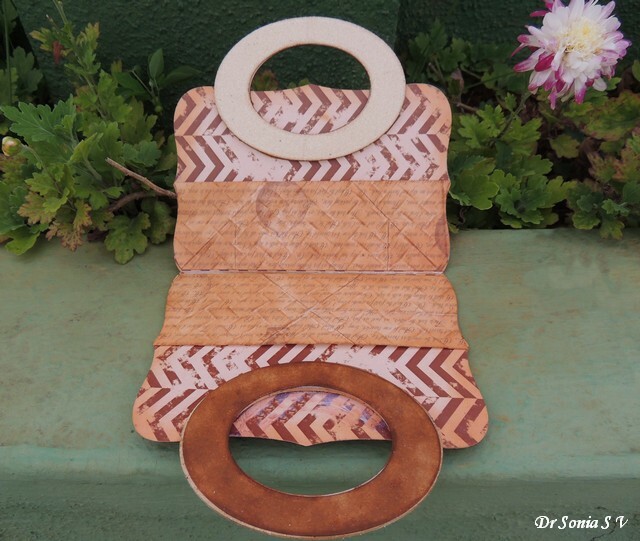 You can make handles for your purse using nesting ovals . If you are using magnets as a closure mechanism you can hide it under the handle. I liked the hidden magnet closure better than the velcro closure mechanism! 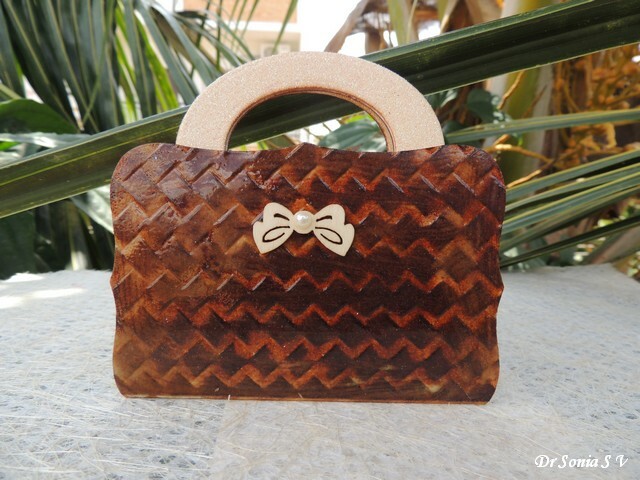 The pockets on inside of the purse can be made by using the same die, trimming the die cut and sticking just the 3 sides . 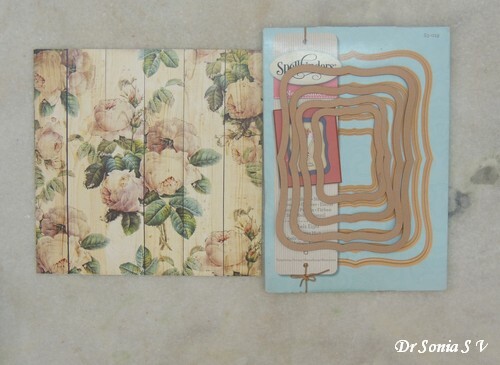 I hope you liked this simple tutorial illustrating one more way to have fun with your crafting supplies! 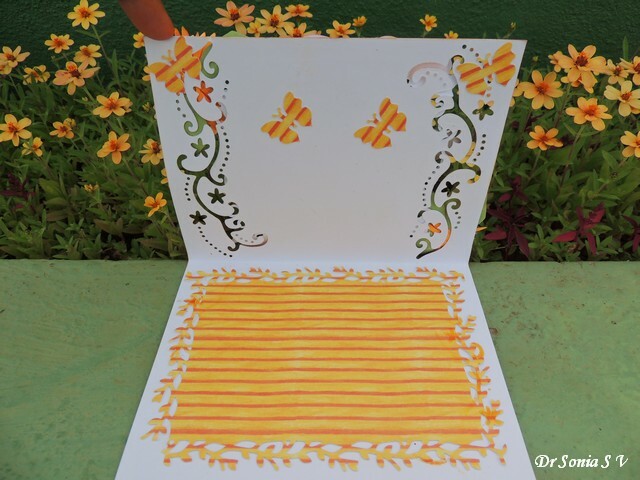 Hi friends , Thank you so much for the lovely comments on my Onam post!! 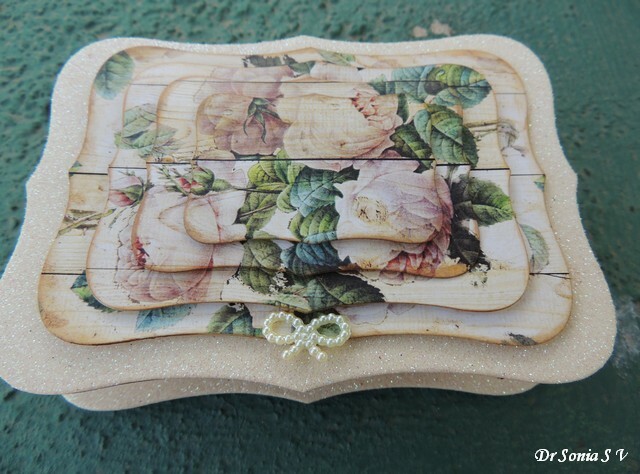 Sharing a hinged box I made with dies and some simple mixed media techniques! 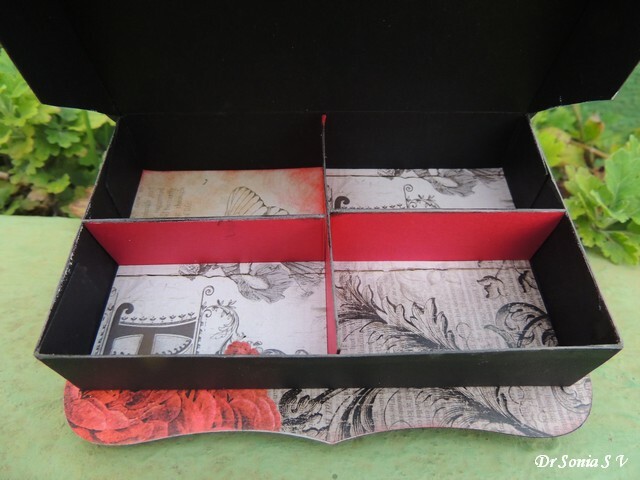 The box as such measures 5 x 3 inches and is made from a single piece of cardstock measuring 9 x 7 inches and I made customised partitions for the inside .The cardstock is scored on the 9 inch side at 1, 4, 5 and 8 inches and on the 7 inch side at 1 and 6 inches. 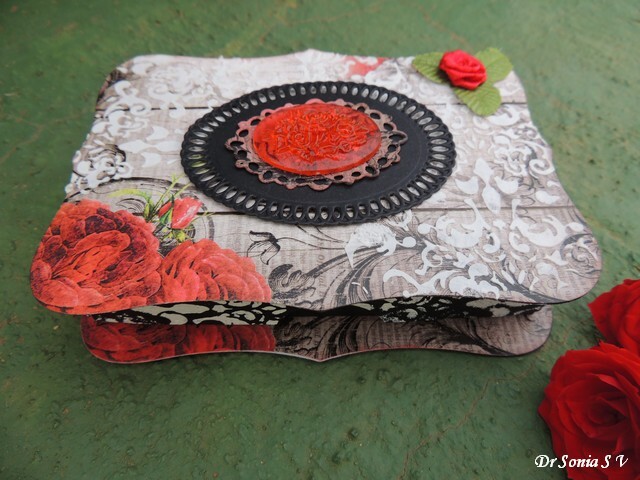 I used the Spellbinders Labels 8 die to die cut the base and lid of my box. As I wanted a sturdy box I layered 2 pieces of card stock under the pattern paper. Stencilled a design using texturing medium Whipped Spackle and the Memory Box Texture Adornment Stencil. 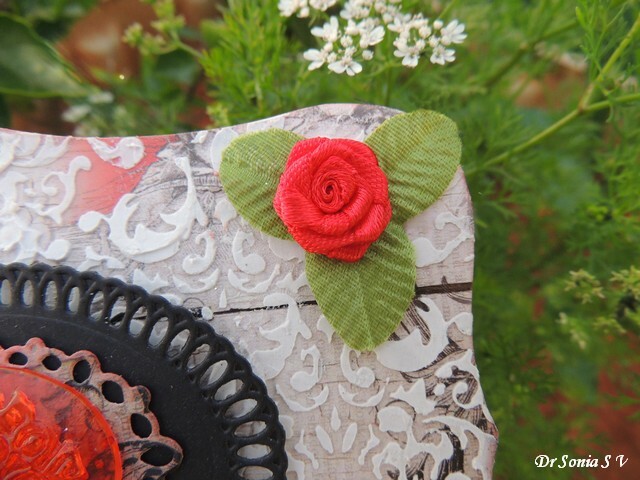 The paper I used was so pretty I kept the embellishing to a minimum! Added a homemade resin cabochon [ made using resin and alcohol ink in a silicon mold] on an oval die cut. Couldnt resist a tiny ribbon rose on the corner of the box! 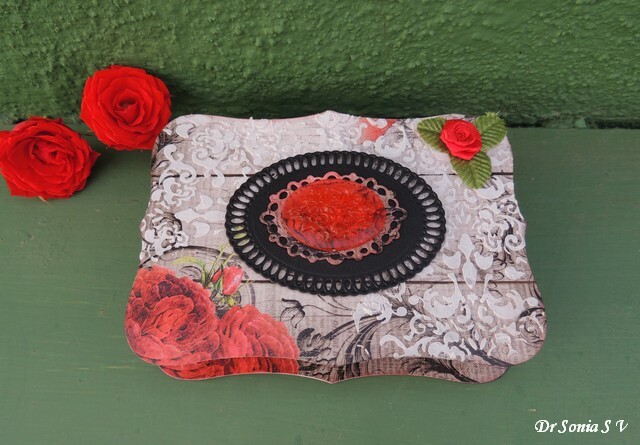 And here is the box with real roses from our garden!